The following tables show the normal maintenance schedule. Depending upon weather and atmospheric conditions, varying road surfaces, individual driving habits and vehicle usage, additional or more frequent maintenance may be required. Periodic maintenance beyond the last period shown on the tables requires similar maintenance. 1) After 40,000 miles (64,000 km) or 48 months, inspect every 10,000 miles (16,000 km) or 12 months. Replace the drive belts if found damaged. (2) If operating mainly in dusty conditions, more frequent maintenance may be required. 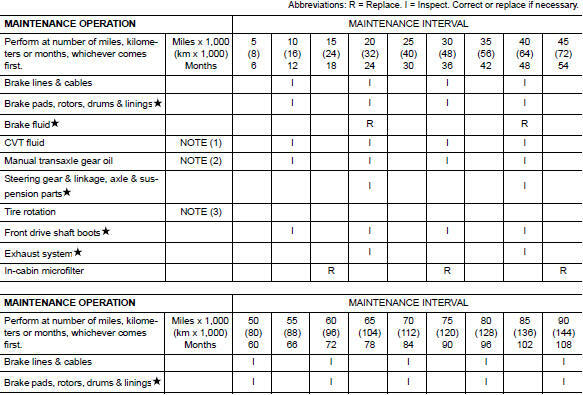 (4) First replacement interval is 105,000 miles (168,000 km) or 84 months. After first replacement, replace every 75,000 miles (120,000 km) or 60 months. (5) Use only Genuine NISSAN Long Life Antifreeze/Coolant (blue) or equivalent with proper mixture ratio of 50% anti-freeze and 50% demineralized or distilled water. Mixing any other type of coolant or the use of non-distilled water will reduce the life expectancy of the factory fill coolant. (6) Replace spark plug when the plug gap exceeds 1.35 Mm (0.053 In) even if within specified periodic replacement mileage. 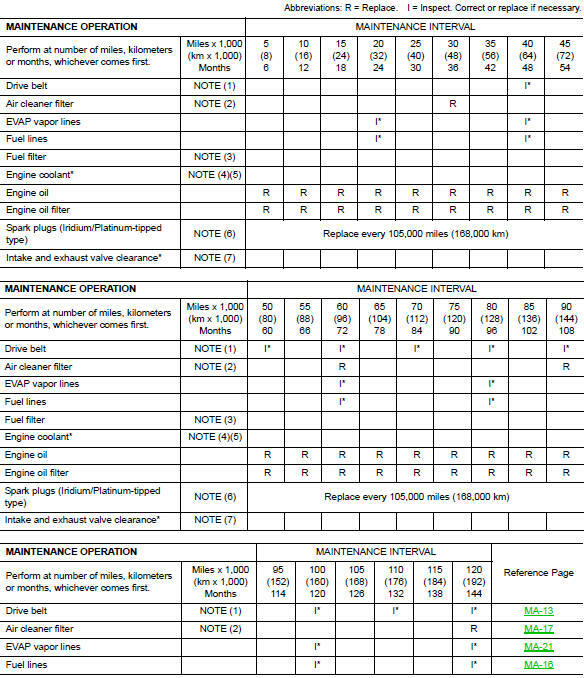 Maintenance items and intervals with вЂњ*вЂќ are recommended by nissan for reliable vehicle operation. The owner need not perform such maintenance in order to maintain the emission warranty or manufacturer recall liability. Other maintenance items and intervals are required. Maintenance items with вЂњ вЂќ should be performed more frequently according to вЂњmaintenance under severe driving conditionsвЂќ. (1) Use only genuine nissan cvt fluid. If towing a trailer, using a camper or a car-top carrier or driving on rough or muddy roads, inspect cvt fluid deterioration at nissan dealer every 60,000 miles (96,000 km), then change cvt fluid if necessary. And if the inspection is not performed, change (not just inspect) cvt fluid every 60,000 miles (96,000 km). Using transmission fluid other than genuine nissan cvt fluid will damage the cvt, which is not covered by the nissan new vehicle limited warranty. (2) If towing a trailer, using a camper or a car-top carrier, or driving on rough or muddy roads, change (not just inspect) oil at every 30,000 miles (48,000 km), 24 months. (3) Refer to вЂњtire rotationвЂќ under the вЂњgeneral maintenanceвЂќ heading earlier in this section. The maintenance intervals shown on the preceding pages are for normal operating conditions. 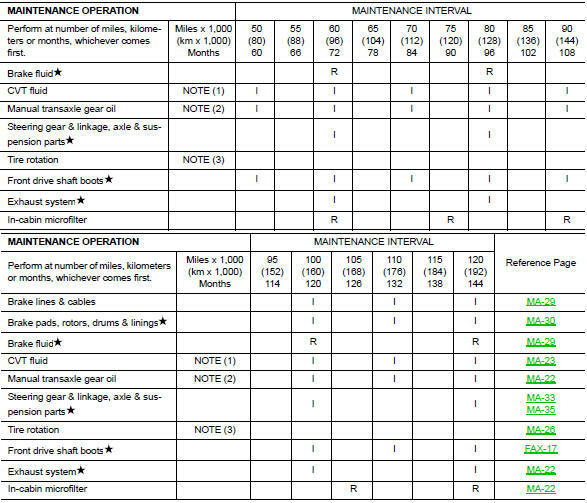 If the vehicle is mainly operated under severe driving conditions as shown below, more frequent maintenance must be performed on the following items as shown in the table. Repeated short trips of less than 5 miles (8 km). Repeated short trips of less than 10 miles (16 km) with outside temperatures remaining below freezing. Operating in hot weather in stop-and-go вЂњrush hourвЂќ traffic. Extensive idling and/or low speed driving for long distances, such as police, taxi or door-to-door delivery use.